Fernando M. Torres-Gil’s multifaceted career spans the academic, professional, and policy arenas. He is a Professor of Social Welfare and Public Policy at UCLA, Director of the UCLA Center for Policy Research on Aging and an Adjunct Professor of Gerontology at USC. He also has served as Acting Dean and Associate Dean at the UCLA School of Public Affairs, and most recently Chair of the Social Welfare Department. He has written six books and over l00 publications, including The New Aging: Politics and Change in America (1992) and Aging, Health and Longevity in the Mexican-Origin Population (2012). His academic contributions have earned him membership in the prestigious Academies of Public Administration, Gerontology and Social Insurance. His research spans the important topics of health and long-term care, disability, entitlement reform, and the politics of aging. Professor Torres-Gil is more than an academic. He has an impressive portfolio of public service and national and international recognition as a leading spokesperson on demographics, aging, and public policy. He earned his first presidential appointment in 1978 when President Jimmy Carter appointed him to the Federal Council on Aging. He was selected as a White House Fellow and served under Joseph Califano, then Secretary of the U.S. Department of Health, Education, and Welfare (HEW), and continued as a Special Assistant to the subsequent Secretary of HEW, Patricia Harris. He was appointed (with Senate Confirmation) by President Bill Clinton as the first-ever U.S. Assistant Secretary on Aging in the U.S. Department of Health and Human Services (DHHS). As the Clinton Administration’s chief advocate on aging, Dr. Torres-Gil played a key role in promoting the importance of the issues of aging, long-term care and disability, community services for the elderly, and baby boomer preparation for retirement. He served under HHS Secretary Donna Shalala, managing the Administration on Aging and organizing the 1995 White House Conference on Aging. In addition, he served as a member of the President’s Welfare Reform Working Group. In 20l0 he received his third presidential appointment (with Senate Confirmation) when President Barack Obama appointed him as Vice Chair of the National Council on Disability, an independent federal agency that reports to the Congress and White House on federal matters related to disability policy. During his public service in Washington, D.C., he also served as Staff Director of the U.S. House Select Committee on Aging under his mentor, Congressman Edward R. Roybal. In 2013, he received the coveted John W. Gardner Legacy of Leadership Award from the White House Fellows Foundation and Association. 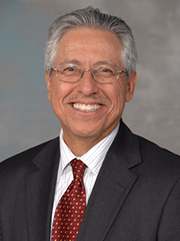 At the local level, Dr. Torres-Gil has served as Vice President of the Los Angeles City Planning Commission and as a member of the Harbor and Taxi Commissions for the city of Los Angeles. During the administration of Los Angeles Mayor Antonio Villaraigosa he served on the Board of Airport Commissioners. At the state level, he was appointed by former Governor Gray Davis to the Governor’s Blue Ribbon Task Force on Veterans’ Homes and by former Governor Arnold Schwarzenegger as a delegate to the 2005 White House Conference on Aging. He continues to provide important leadership in philanthropy and non-profit organizations including as a board member for AARP. In addition, he is a former board member of The California Endowment; the National Steinbeck Center in Salinas, California; and the Los Angeles Chinatown Service Center. He most recently served as a member of the Institute on Medicine’s (IOM) End-of-Life Committee (2013-2014). Dr. Torres-Gil was born and raised in Salinas, California, the son of migrant farm workers. He earned his A.A. in Political Science at Hartnell Community College (1968), a B.A. with honors in Political Science from San Jose State University (1970), and an M.S.W. (1972) and Ph.D. (1976) in Social Policy, Planning and Research from the Heller Graduate School in Social Policy and Management at Brandeis University. "The future of the United States will rest heavily on the next generation of workers and elders; populations heavily diverse and Latino and living longer. Thus, we must understand and respond to their unique demographics."